Falafel Sandwich and Belgian Fries. Don’t let the name fool you. Maoz is not a vegetarian restaurant. (I mean, come on. Can you imagine me frequenting vegetarian restaurants? Sorry, PETA.) 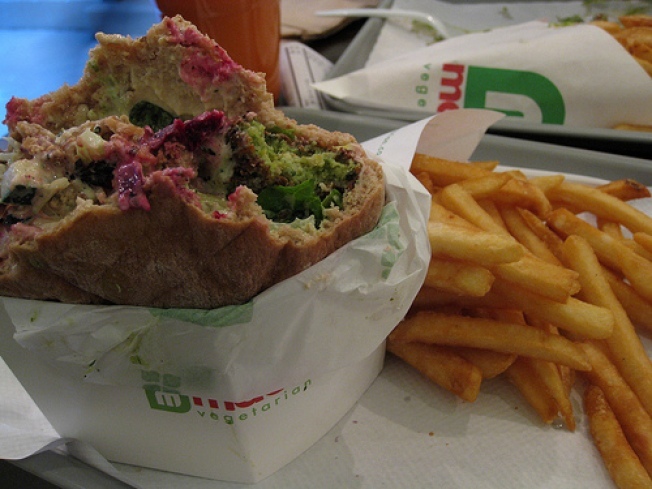 Anyway, Maoz is an international falafel chain (yes, chain), and admittedly, an incredible one at that. I ended up at Maoz one evening when my dining companion, who had lived in Philadelphia, recognized the restaurant’s bright green logo from her East Coast days on Berkeley’s Telegraph Avenue. The new storefront is California’s first location, and it was busy. I ordered a falafel sandwich with Belgian fries, and commenced to the topping bar. With items like beet salad, roasted cauliflower, spiced chickpeas, and garlicy yogurt sauce, Maoz gives new meaning to “topping bar.” I sprinkled my sandwich to my heart’s content. The falafel sandwich includes a slice of fried eggplant, which is really just the greatest addition ever to a falafel sandwich, if you ask me. The fries were prepared well too: crispy on the outside, soft on the inside, and perfect dipped into equal parts yogurt sauce and ketchup. The menu at Maoz may be limited (four items, to be exact), but it’s all delicious. And really, when there’s falafel and fries on the menu, what more do you need?